Our 2018 classes are up and running! The first 5 adult classes filled up fast: beginner weavers, beginner machine sewists (2 classes), beginner crocheters, and computerised machine explorers. There are spaces in 2 of the classes that start this week - beginners' knitting and one-step-up crochet - so enrol now for those! The timetables for all adult classes are on our website and available in hard copy in the shop. 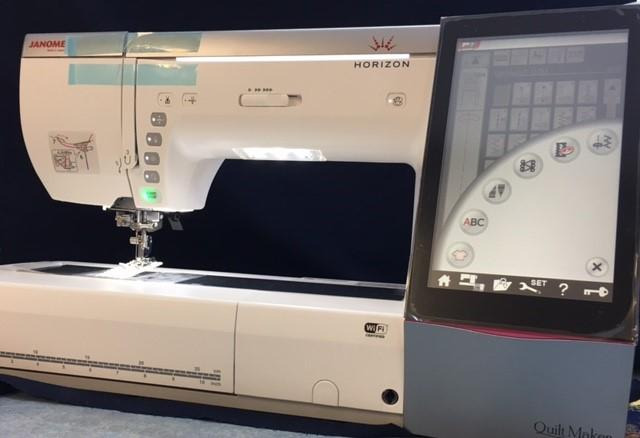 There are 4 distinct adult timetables – Machine sewing and overlocking; Quilting; Woolly classes; and Stitching. In total we’re offering about 70 classes this year! Enrol in the shop or by emailing jo@sewingdirect.co.nz Payment confirms your place in a class because there are only limited places - 6 is the norm. The latest classes to be added to our timetable are two Tunisian crochet classes taught by Shirley Mooney. Tunisian crochet is a mix of knitting and crochet. Class 1 is on Tuesday 15 May 6.15 to 8.15pm and class 2 (a separate class, which is a repeat of class 1) is on Thursday 17 May 6.15 to 8.15pm. The class fee is $30. 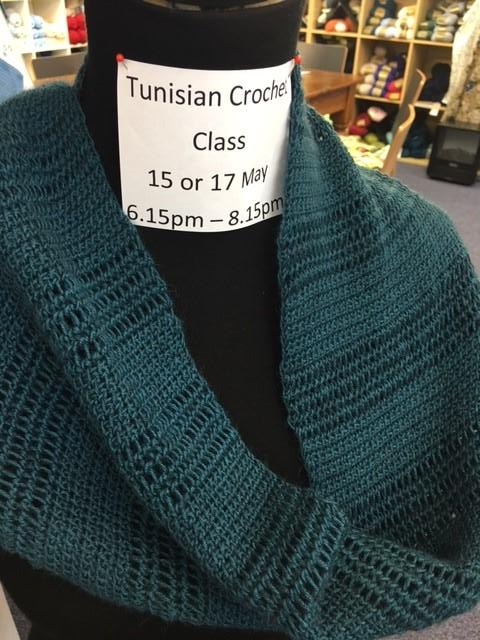 The 17 May class is filling up fast but there are still spaces in the Tuesday class. We’ll hold more kids’ classes (for age 9 and over) in the July school holidays. The timetable will be available in a few week's time. Book early so we can organise extra classes if there’s lots of interest. In time for the cooler weather we’ve boosted our already wonderful selection of yarns! To make room for the newbies, we’ve discounted the lines that we won’t stock in future - often because they’re no longer available. We’ve sold lots of those but still need more shelves to house all the yummy new yarns! 8 ply – Heirloom Merino, Heirloom Alpaca, Cleckheaton Country and Country Naturals, Loyal Las Vegas Tweed, Countrywide Suri Lana. 10 ply – Fiddlesticks Superb Tweed Acrylic, DY Choice La Paz, Countrywide Aran. 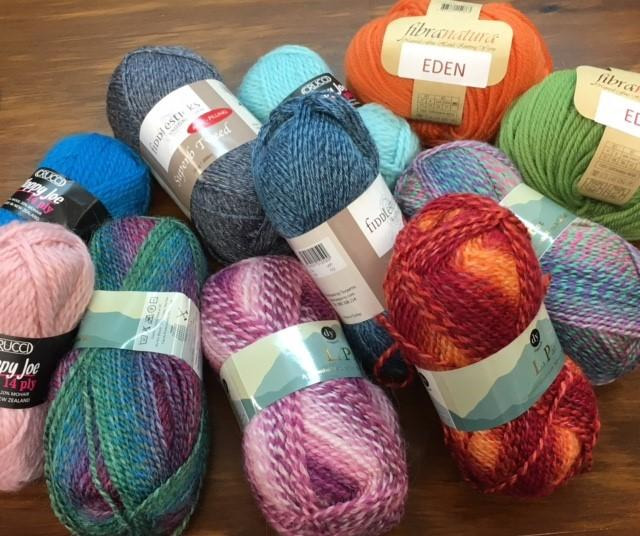 And we have a new Fiddlesticks bamboo blend sock yarn, some gorgeous Katia Infinity shawl and Baby paint cakes, and lots of new colours in our “regular” brands. Our wool room is now a very colourful, warm and cosy place. When the Thursday morning knitting group is there (10am to noon) it’s also full of laughter! Come along any Thursday if you want to knit and natter. It’s free! There’s also a (smaller) needle felting group that meets in the wool room on Tuesday mornings (10am to noon). It’s free too. All welcome! 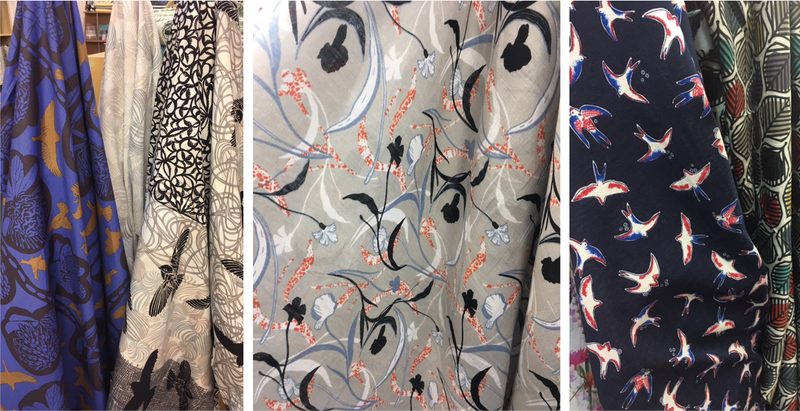 Just arrived: beautiful new dressmaking fabrics - and more due any day. Come and see our new 100% merinos, organic cotton, Italian fabrics (100% linen, 100% cotton knit and 100% cotton), crepe, boiled wool, 100% wool - a tasteful selection perfect for use with our stock of StyleArc and Papercut patterns. We're always updating our 100% cotton collection - ideal for craft and clothing - so keep checking them out. At the moment we've discounted more than 100 of our 100% cottons to $12 or $8 a metre, to make room for more new ones. One of our fave Janomes, the DC7100 (RRP $999), is no longer being made. We bought up the last ones in NZ because we believe so strongly in the machine’s excellence. We have just a few left at the instore special price of $949! Two very similar models will take the place of the DC7100: the DC 6050 ($799) and the DC 6030 ($899). We’re selling these now and have become very fond of both!. Recently, our customers have shown a renewed interest in hand stitching and we’ve bought in tapestry frames (lap and standing) to make their lives easier. 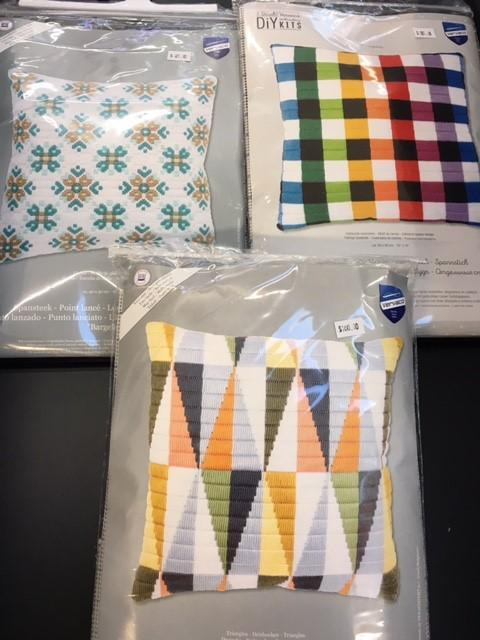 We’ve just received some modern geometric patterned tapestry kits that will make lovely cushion fronts. We’re also offering embroidery classes, including a new Folk Art class for beginners. One of our designer customers has had fun coming up with a pattern for use in that class. It too would be ideal on a cushion front, or a skirt, or a tote bag …. the possibilities are endless! You may have seen a new staff member providing excellent service each Monday, Friday and Saturday. She’s Toni Stout – an experienced sewist, quilter, embroiderer, knitter... all round craftsperson in fact, and we’re delighted to have her on our team. From this week we won't need to call on Toni quite so often because Trish is back working part-time after knee surgery and Youhan, who works some Saturdays, is also back after knee surgery (we didn't injure them, honest! ).